Despite the fact that the table are well presented with full and accurate information, I would wish to add two more rows including weight and shape of the cranium. This is due to the fact that Orangutan, Gorilla, Chimpanzee and Modern Human have different body weight with varying cranium. Hence, by adding body weight and shape of the cranium, we will be able to know which one is heavy, the shape of its cranium and the reasons behind them. For instance Orangutan is 86 Kg, Gorilla 75-85Kg, common Chimpanzee 33-48Kg and Modern Human 45-115Kg. The above phylogenetic scheme otherwise known as a cladogram in my opinion best describes the relationships between the Orangutan, Chimpanzee, Gorilla, and Humans.The first part basically represents human who are considered to be the most evolved of all other apes. The Hominidae family include two unique and distinct species of chimpanzee which include the common chimp whose scientific name is Pan troglodytes and the Bonobo whose scientific name is Pan paniscu.Gorilla has two distinct species , the eastern gorilla whose scientific name is Gorilla graueri and the western gorilla whose scientific name is Gorilla gorilla. The orangutan also comprises of two species namely, the Sumatran orangutan whose scientific name is Pongo abelii and the Bornean orangutan whose scientific name is Pongo pygmaeus. The hybalotes (gibbon) is also part of the living genera of this Hominoidea family. 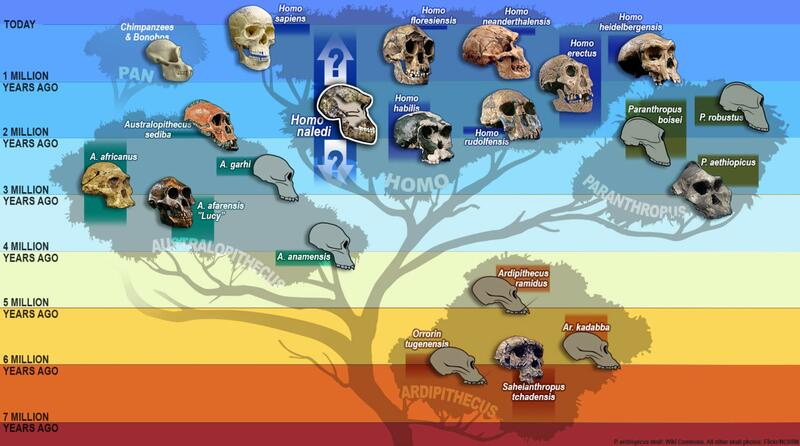 Despite the fact that that there are some differences among each hominid species and modern man, there are also notable similarities in that they are closely related to modern man. For instance, both Chimpanzee and modern man in that both have tibia thicker and straighter, rib cage broad and extends past vertebral column and lastly, both have scapulae on the back, shoulder joints oriented to the sides. Similarly both gorilla and modern man have similarities in that they both feed on animals and plants. They walk upright for a longer period of time. Both gorilla and modern man have no tails and have many large, highly developed brains. Both orangutan and modern man are highly intelligent. They also have an enormous arm span with ability of stretching up to more than 7 feet. Both feed on insects, meat, fruits and plants. In both, there is a strong bond between mothers and their young ones. The real live human measurements that I gathered from myself and some of my classmates include ,a body height of approximately 5.5ft for males and 5.3 ft for females, weight of a mature male is approximately 150 lbs and a females is 140 lbs ,the chest of a male is normally approximately 90 cm for males and 80 cm for females ,the thigh is normally approximated to be 54 cm in males and 60 cm in females and last but not least the hips of a male are normally approximated to be 90 cm and those of a female are normally approximated to be 100cm.